The tradition of exchanging cards on occasions and otherwise has been a great form of greeting over the ages, since the starting of civilization. 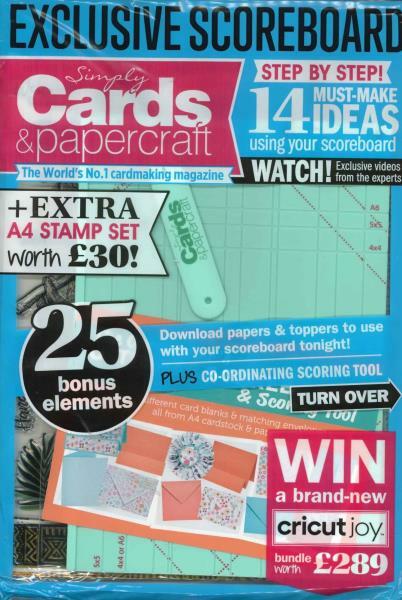 Buy a single copy or subscription to Simply Cards & Papercraft magazine. This conventional activity has been adored and accepted by everyone. Even in today’s world of modern technology, including the internet, cards is still one of the best ways of expressing your love or gratitude for someone. Handmade cards still hold a lot of importance in expressing your love. It is the best magazine, devoted to a wide range of ideas for making cards for your loved ones. It gives you different ideas, and helps you create stylish, beautiful and meaningful cards for every occasion. These cards perfectly convey your love to your loved ones and light up their faces every time they see the card. This magazine has been highly appreciated by all the readers and is adored by everyone. The magazine also focuses on other minor paper craft work that you can engage you, during your spare time. You can not only make bright and wonderful cards, but also make gifts for the people you love. This magazine truly reflects upon the spirit of love in society and the effort people put in for each other. It also presents to you examples of cards that you can draw inspiration from. So, if you have not read the magazine yet, this is your chance to grab an issue from the newsstand or buy a subscription to enjoy everything that the magazine has to offer, at the comfort of your home. Subscription is fun, easy and affordable. It gives you assured gifts. You can get the magazine issues delivered to your doorstep every month. So, read the magazine and get innovative ideas to make cards and gifts for your loved ones, and to make them feel all the more special. I've had this magazine for many years and think the presentation is good and the projects and articles are excellent. The free gifts are great!This is my favourite craft magazine. I really like the magazine, it is always full of brilliant ideas and great free gifts.